Don't confound this regional state of the Zhou period with the Southern Qi dynasty 南齊 (479-502) or the Northern Qi dynasty 北齊 (550-577) of the Southern and Northern Dynasties period 南北朝 (300~600). Qi 齊 was an important regional state of the Zhou period 周 (11th cent.-221 BCE). It ruling dynasty was during the Warring States period 戰國 (5th cent.-221 BCE) replaced by the family Tian 田. The ancient territory of Qi was located in the northern parts of the Shandong peninsula and then expanded towards the south and west. Map according to Tan Qixiang 谭其骧 (1987), Zhongguo lishi ditu ji 中国历史地图集. Qi was located in the western parts of the Shandong Peninsula. During the Warring States period it erected a defensive wall to protect the territory against attacks from the southern state of Chu. Qi was the eastern counterpart of the state of Qin in the west, but played in the end the weaker part. Click to enlarge. The ancestors of the house of Qi are said to have been tribal chieftains under the mythical emperors Yao 堯 and Shun 舜 and assistants of Yu the Great 大禹, the founder of the Xia dynasty 夏 (17th-15th cent. BCE). For this achievment they were made regional rulers of Lü 呂 and Shen 申 (located in the border region of the modern provinces of Shanxi and Shaanxi). Lü later became one of their family names. The dynastic founder, for example, is called Lü Shang 呂尚 (literally "the Elder of Lü"). The actual family name was Jiang 姜. The Jiang intermarried with the family Ji 姬, the Zhou dynasty. When Ji Chang 姬昌, Earl of the West 西伯 and eventual founder of the Zhou dynasty, went out hunting, he met Lü Shang. Lü Shang was already an old man and loved fishing. It had been prognosticated to the Earl of the West (better known as King Wen of Zhou 周文王, 11th cent. BCE) that he would meet a competent advisor when out on a hunt. The Earl therefore, "expecting" (wang 望) to encounter such a counsellor, was happy to meet Lü Shang, and therefore granted him the personal name Wang 望 (Lü Wang 呂望). According to another story, the Earl's followers Sanyi Sheng 散宜生 and Hong Yaosu 閎夭素 invited Lü Shang to serve their lord when the latter was imprisoned in Youli 羑里 by the king of Shang 商 (17th-11th cent. BCE). Lü Shang accepted their invitation, and together they bribed the king of Shang to set free the Earl of the West. Lü Shang served the Earl of the West during his campaigns against the depraved King Zhou of Shang 商王紂. He is therefore highly venerated as a military strategist, and authorship of the military treatise Liutao 六韜 is attributed to him. After King Wen's death, Lü Shang served his son, King Wu 周武王. At the ford of Mengjin 盟津, the King made a Great Proclamation (Taishi 泰誓, a chapter of the Shangshu 尚書), supported by Lü. He also played a decisive role in the battle of Muye 牧野, where the Shang army was defeated. In the ensuing ceremony of the foundation of the Zhou dynasty, Lü Shang played an important role as advisor to the king. He was therefore made regional ruler (zhuhou 諸侯) of Qi 齊, with the residence in Yingqiu 營丘 (near modern Linzi 臨淄, Shandong). After he had arrived in his state on the Shandong peninsula, he first had to fight against local chieftains, like the Lord of Lai 萊侯. The new ruler of the region appeased the local tribes and started to built up a strong state. During the reign of the young King Cheng of Zhou 周成王, Lü Shang took part in the suppression of the rebellion of the king's uncles from Guan 管 and Cai 蔡. After Lü Shang died, he was given the temple name "Grand Duke" Qi Taigong 齊太公. Duke Ai of Qi 齊哀公 (10 cent. BCE) was slandered at the royal court of the Zhou, demoted, executed and replaced by his younger half-brother, known as Duke Hu 齊胡公. The latter moved the capital to Pugu 蒲姑 (or Bogu 亳姑, near modern Boxing 博興, Shandong). Duke Hu was killed by a younger brother of Duke Ai who mounted the throne. He is posthumously known as Duke Xian 齊獻公. The capital was shifted back to a location in the vicinity of the former one, that was renamed Linzi 臨湽 and remained the capital of Qi until the foundation of the Qin empire 秦 in 221 BCE. Duke Li 齊厲公 (r. 824-816) was a notoriously cruel person and was killed by a surviving son of Duke Hu. The successor of Duke Li was his son Prince Chi 赤, known as Duke Wen 齊文公 (r. 815-804). During the reign of Duke Xi 齊釐公 (r. 730-698) the Northern Rong 北戎 barbarians made raides on the soil of Qi. Qi was military supported by the small, but powerful state of Zheng 鄭. When Duke Xi offered Prince Hu 忽 of Zheng one of his daughters, the Prince declined because the small state of Zheng could not accept such an offer from the large state of Qi. Duke Xi had a nephew, "Ducal Grandson" Gongsun Wuzhi 公孫無知, whom he loved very much. Wuzhi was educated together with his cousin, the crown prince. When the latter ascended to the throne (posthumouly Duke Xiang 齊襄公, r. 697-686), the two men separated in jealousy. Duke Xiang had an affair with his cousin which was married to Duke Huan of Lu 魯桓公 (r. 712-694). When the duke of Lu learned from the affair, Duke Xiang had the husband of his lover assassinated by a man called Peng Sheng 彭生. In order to appease the ruling family of Lu, Peng Sheng was executed. In 689, Qi conquered Ji 紀, a small vassal state of Lu. Duke Xiang dispatched the nobles Lian Cheng 連稱 and Guan Zhi Fu 管至父 as overseer of the capital outpost Kueqiu 葵丘. When no replacement was sent after a long time, the two incited Prince Wuzhi to rebel against the Duke. On a hunt the duke injured his foot, an incident that offered a chance to attack him. With the help of a servant, they entered the palace and killed Duke Xiang. Prince Wuzhi became the next ruler, but he was soon assassinated during an inspection tour. After some time of indecision, a younger brother of Duke Xiang, Prince Xiaobai 小白, was brought back from Lu, to where he had escaped in fear for his life. Prince Xiaobai was supported by Bao Shu Ya 鮑叔牙, Gao Xi 高係 and Guo Yizhong 國懿仲, while his competitor for the throne, Prince Jiu 糾, was supported by Guan Zhong 管仲 and Shao Hu 召忽. When Prince Xiaobai was received from exile in the small state of Ju 莒, Guan Zhong had him attacked and shot at, but Prince Xiaobai only feigned to be dead. He then immediately proceeded to Linzi, where he was enthroned as the duke of Qi (Duke Huan 齊桓公, r. 685-643). He dispatched an army to attack the state of Lu that supported Prince Jiu. The army of Lu was defeated, and Duke Huan ordered the ruler of Lu to execute his rival Prince Jiu. Shao Hu committed suicide, and Guan Zhong offered himself for encarceration. Bao Shu Ya knew that Guan Zhong would be a very competent advisor to strengthen the state of Qi economically and politically. The Duke thereupon offered Guan Zhong to employ him as a counsellor, and Guan accepted. With Bao Shu Ya, Xian Peng 隰朋, Gao Xi and Guan Zhong as advisors, Duke Huan was able to become the dominant ruler of his time. He first annihilated the small state of Tan 郯 (also written 譚), then forced the state of Lu into obedience, and conquered the small state of Sui 遂. He also responded positively to the request of the nobleman Cao Mo 曹沫 and gave back the tracts of land he had conquered from Lu. This benevolent stance contributed to the confidence of other regional rulers that Duke Huan of Qi would be a good-natured leader of the states of the Zhou empire. In 681, Duke Huan assembled the lords of Song, Chen, Cai and Zhu 邾 at Beixing 北杏 and summoned the duke of Lu to Ke 柯 where he forced him to accept the suzerainty of Qi. A year later he assembled the regional rulers at Zhen 甄 and was thus more or less officially accepted as hegemonial lord (ba 霸). In 672, Prince Wan 完 from Chen 陳 asked for refuge in Qi. He was made Minister of Works (gongzheng 工正) and given the noble family name Tian 田. He was the ancestor of the second dynasty of Qi, the house of Tian. His posthumous title was Tian Jingzhong 田敬仲. There are several explanations for the origin of the name Tian 田. Wan probably wanted to get rid of the name of Chen 陳 and changed the characer (the graph 田 being a fragment of the graph 陳). The pronunciation of Chen and Tian was very similar at that time (/lrin/ and /lˤiŋ/). Another story says that during his flight from Chen, Prince Wan had to live from the fields (tian 田) he passed and therefore adopted the word for "field" as his surname. Tian Wan's son was Zhi Meng Yi 稚孟夷 (or Yi Meng Si 夷孟思), and his grandson Min Meng Zhuang 湣孟莊 (also called Min Meng Ke 閩孟克 or Min Meng Zhi 湣孟芷). The latter was the father of Wenzi Xuwu 文子須無 (posthumous title Tian Wenzi 田文子), an advisor to Duke Zhuang of Qi 齊莊公 (see below). In 663, the Mountainous Rong barbarians 山戎 attacked the state of Yan 燕 in the northeast. Duke Huan supported Yan with an army and defeated the barbarians. Duke Zhuang of Yan 燕莊公 (r. 690-658) escorted Duke Huan back to the border. Highly impressed by this courtesy, Duke Huan presented Duke Zhuang with a strip of land and admonished him to revive the benevolent and loyal government from the times of his ancestor, the Duke of Shao 召公. Duke Huan's sister Ai Jiang 哀姜 was married to Duke Min of Lu 魯湣公 (r. 661-660), but had an affair with Prince Qing Fu 慶父. The Prince killed Duke Min, but the nobles of Lu did not want to make him the successor. Duke Huan of Qi, on his side, called back Ai Jiang and had her executed. Duke Huan also supported Duke Wen of Wei 衛文公 (r. 659-635) and the lord of Xing 郉 whose territories had been invaded by the Di barbarians 狄 (also written 翟). In 656, a private incident led to a campaign against the state of Cai 蔡: Duke Huan's wife was a princess from Cai. On a boat trip she annoyed the Duke by rocking the vessel. The Duke ordered her to stop, but she continued playing. Enraged by her disobedience, he sent her home to Cai, where her father immediately remarried her to somebody else without officially solving the marriage with Duke Huan of Qi. Cai was therefore destroyed by the army of Qi. In the next year, Duke Huan, as a protector not only of the other regional states, but also of the royal house of Zhou, attacked the southern state of Chu 楚 with the charge to have failed delivering tributes to the king of Zhou. The two armies did not dare to attack each other, but concluded peace at Zhaoling 召陵. On the way back, Duke Huan punished the state of Chen for its improper treatment of the army of Qi. In 651, Duke Huan assembled the regional rulers again in Kuiqiu 葵丘, this time under the supervision of King Xiang of Zhou 周襄王 (r. 651-619). Some of the regional states gradually felt overruled by the powerful and arrogant duke of Qi. The royal Counsellor-in-chief, Ji Kong 姬孔, advised the duke of Jin 晉 not to take part in the meeting of the regional rulers. Shortly after, the duke of Jin died, and the duke of Qin 秦 tried to enthrone Prince Yiwu 夷吾. Yet once again, Duke Huan of Qi was able to dominate the internal quarrel in Jin and manage to enthrone his favourite in the state of Jin. The other powerful states of that time, Qin and Chu, were outsiders and took not part in the convents to accept the hegemony of Qi. Duke Huan did not perceive the limits of his power and was only halted by Guan Zhong who urged Duke Huan of Qi not to perform the offerings to Heaven and Earth because this was a prerogative of the king of Zhou. In another occasion, Guan Zhong led an army to save the royal house of Zhou from an attack by the Rong barbarians, but he declined the King's offer of the post of senior minister of Zhou. Duke Huan gave exile to Prince Dai 帶, a younger brother of King Xiang of Zhou. Against the advice of the dying Guan Zhong, Duke Huan made Yi Ya 易牙, Kai Fang 開方 and Shu Dao 豎刀 his counsellors. None of them was a real substitute of the late counsellor Guan Zhong. When Duke Huan died, Prince Wugui 無詭 was made the new ruler of Qi. Prince Zhao 昭 escaped to the court of Song 宋. The fights for power among the princes and their supporters in the ducal palace in Qi were so heavy that nobody had time to coffin the corpse of the late duke. For more than two months his remains were unburied. Wugui died after three months of regency. He was succeeded by Prince Zhao (Duke Xiao 齊孝公, r. 642-633), Prince Pan 潘 (Duke Zhao 齊昭公, r. 632-613), Prince Shangren 商人 (Duke 齊懿公, r. 612-609), and finally Prince Yuan 元 (Duke Hui 齊惠公, r. 608-599), all of them sons of Duke Huan by different mothers. Duke Xiao was enthroned with the support of the Duke of Song who threatened to invade Qi and had Wugui assassinated. Inspite of this fact, Duke Xiao later conquered Song because the duke of that state did not participate in the convent of the regional rulers guided by the ruler of Qi. This was the last attempt of a ruler of Qi to revive the old hegemonial power of Qi. Duke Zhao came to the throne because he had killed Duke Xiao's heir by his supporter Kai Fang. He was succeeded by his son She 舍, but She was soon killed by his uncle Shangren, Duke Yi. He was killed by two noblemen which he had deeply offended, Bing Rong 丙戎 (Duke Yi had cut off the feet of Bing's father's corpse) and Yong Zhi 庸職 (the duke had taken Yong's wife into his harem). His successor was Duke Hui. During the reign of Duke Qing 齊頃公 (r. 598-582), Duke Hui's son, the states of Chu, Jin and Song dominated the fate of China. Very important was the quarrel between Qi and Jin, triggered by the duchess' impoliteness against Xi Ke 郤克, the ambassador of Jin, who had a hunchback. Xi Ke on his side killed four legates from Qi before his lord, the duke of Jin, attacked Qi. Duke Qing was able to conclude peace by sending his son, Prince Qiang 強, as a hostage to Jin. When Qi attacked Lu and Wei 衛, Xi Ke persuaded the duke of Jin to punish Qi. In the battle of Mt. Miji 靡筓 near An 鞍 (near modern Jinan 濟南, Shandong), the troops of Qi had a hard stand against Xi Ke, but Pang Chou Fu 逄丑父 from Qi saved his duke and managed to consolidate the front at Maling 馬陵. Somewhat later, Duke Qing paid a visit to Duke Jing of Jin and revered him like a king. Back in Qi, he began to easen the tax burden, supported widows and orphans, and rewarded those injured in the war. Duke Qing was succeeded by his son Prince Huan 環 (Duke Ling 齊靈公, r. 581-554). When Jin attacked Qi in 573, Duke Ling sent his son, Prince Guang 光, as a hostage. After returning, Guang was made crown prince and took over important tasks in the government. He represented Qi, for example, at the meeting with the other regional rulers in Zhongli 鍾離. In 555, Jin attacked Qi again, and the duke was besieged in the capital Linzi. He first wanted to flee, but Yan Ying 晏嬰, a political advisor, suggested him to stay, and the army of Jin soon withdrew, after having plundered the surroundings. For a short time Duke Ling thought about making Prince Ya 牙 crown prince, but he was pursuaded not to do so. Prince Guang, with the help of Cui Zhu 崔杼, later killed Prince Ya and Lady Rong 戎姬, who had tried to pursue the Duke to change the crown prince. Prince Guang mounted the throne. He is known as Duke Zhuang 齊莊公 (II, r. 553-548). When Luan Ying 欒盈, a nobleman of Jin, asked to be given refuge in Qi, Duke Zhuang treated him most favourably, inspite of the warnings by Yan Ying and Tian Wenzi 田文子. He furthermore militarily supported Luan Ying's attempt to destroy the ducal house of Jin and helped him to control the region of Quwo 曲沃. After defeat against the army of Jin, the troops of Qi were still able to conquer the city of Chaoge 朝歌. Tian Wenzi's son Wuyu 無宇, known as Tian Huanzi 田桓子 or Chen Huanzi 陳桓子, also served Duke Zhuang. Duke Zhuang had an affair with the wife of Cui Zhu. The latter sought for revenge and secretly plotted against the Duke. During a visit of the Duke of Ju 莒, Cui Zhu feigned sickness. Duke Zhuang, under the pretext to pay his minister a visit, came to the mansion of Cui Zhu where he was arrested by the retainers of Cui Zhu. In vain he tried to persuade them to set him free or to allow him to commit suicide. He was, instead, shot by arrows when he tried to climb the wall to escape. Yan Ying, an ardent supporter of the Duke, could not but weep because his master had died because of a private affair, and not for the sake of the country. Cui Zhu enthroned Duke Zhuang's younger brother, Prince Chujiu 杵臼 (Duke Jing 齊景公, r. 547-490). Cui Zhu and Qing Feng 慶封 were counsellors to the Duke. Yan Ying criticized them because they tried to win the support of the inhabitants of the capital for themselves, instead of to the Duke. Yan was spared, but the grand scribe (taishi 太史) Xie 寫 was executed because he openly criticized Cui Zhu for having murdered the late duke. The alliance between Cui Zhu and Qing Feng broke apart when two sons of Cui Zhu, Cui Cheng 崔成 and Cui Qiang 崔強, had a quarrel with their half-brother, Cui Ming 崔明, and his relatives. The two brothers called Qing Feng for help and murdered the relatives of their stepmother, Ms Dongguo 東郭. Cui Zhu thereupon personally paid a visit to Qing Feng and charged him of interfering into his private affairs. Qing Feng, who planned to annihilate the house of Cui, had all of the brothers killed, and Cui Zhu thereupon commited suicide. His corpse was dismembered and exhibited on the street as that of the murderer of Duke Zhuang. From 546 on, Qing Feng remained the sole powerful counsellor of the state. The boundless power of Qing Feng aroused the suspicion of other noble families of Qi. They conspired with Qing Feng's son Qing She 慶舍, who helped the nobles of the families Tian 田, Bao 鮑, Gao 高 and Luan 欒 to occupy the official residence of Qing Feng. The latter could escape to Lu, and then to Wu 吳, where he was received with greatest honours. In the next years, Duke Jing established good relationships with the state of Jin. He dispatched Yan Ying to discuss the rising power of the Tian family in Qi. Tian Qi 田乞 (posthumous title Tian Xizi 田釐子 or Chen Xizi 陳僖子) and Tian Kai 田開 (posthumous title Tian Wuzi 田武子 or Chen Wuzi 陳武子) were sons of Tian Huanzi. Tian Qi was known for his freehanded handling of ducal affairs. When collecting tax grain he had the small bushel used (xiaodou 小斗), but when distributing grain to the people, his functionaries used used the large bushel (dadou 大斗). For this reason he was loved by the people but criticized by competitors as someone who desired to buy the hearts of the people. In 517, Duke Zhao of Lu 魯昭公 (r. 541-510) sought refuge in Qi after the house of Ji 季 had come to power. Duke Jing conquered a strip of land from Lu, Yunyi 鄆邑, where he provisionally installed Duke Zhao. A year later, a comet appeared in the sky and Duke Jing interpreted this event as a bad omen and ordered to offer sacrifices to the spirits. Yan Ying, his advisor, criticized the Duke. He held that the only beings worth of being worshipped and to be treated with benevolence were the people, and not the spirits. In 500, Yang Hu 陽虎, a rebellious nobleman of Lu, had to escape to Qi and asked for protection, but this was denied to him. A year later Duke Jing met with Duke Ding of Lu 魯定公 (r. 509-495). At that time, Confucius was an advisor to the duke of Lu, and Duke Jing feared that Lu could develop into a powerful state. He therefore planned to arrest the Duke of Lu on a ceremony during which the "indecorous" music of the region of Lai 萊 was played. Confucius, following the rhythm of the music, approached the sacrificial terrace and had the dancer arrested. Duke Jing was so moved by this loyalty and sharp-wittedness that he gave back a strip of land he had Lu formerly conquered from Lu, instead of capturing the Duke of Lu. In 493, the noblemen of the houses Fan 范 and Zhonghang 中行 rebelled against the duke of Jin. They asked Qi for support with grain for the army. Duke Jing hesitated, but Tian Qi persuaded the Duke to support the rebels. When it came to the moment to speak about the successor to the throne, Duke Jing preferred Prince Tu 荼, son of a secondary wife, but of minor age, from a mother of low origins, and of mediocre conduct. The nobles instead urged the Duke to choose a son of a concubine but had no success. Prince Tu was enthroned and ruled as Yan the Kid 晏孺子 (r. 489). The other princes were resettled to the distant place of Laiyi 萊邑. In fear for their lifes, all of them left the contry and sought exile anywhere else. Under the rule of the infant duke, Tian Qi and Bao Mu 鮑牧 intrigued against the ministers Guo Xia 國夏 (posthumous title Guo Huizi 國惠子) and Gao Zhang 高張 (posthumous title Gao Zhaozi 高昭子). Although both were defended by the ducal guard, Gao was killed, and Guo escaped to Ju. Tian Qi called back Prince Yangsheng 陽生 from exile and enthroned him. After some hesitation, Bao Mu accepted Tian Qi's coup, and Yan the Kid was killed. Tian Qi became the counsellor of the new ruler, known as Duke Dao 齊悼公 (r. 488-485). During his exile in Lu he had married the sister of the potentate Ji Kangzi 季康子. When he came back to Qi, the girl had an affair with her relative Ji Fanghou 季魴侯, for which reason the Ji family did not dare to sent her to her husband in Qi. Duke Dao dispatched an army to take Lady Ji with force, and at the same time occupied a strip of land. A few years later, Lu asked the state of Wu 吳 in the southeast for military support. During the campaign, Bao Mu assassinated Duke Dao. The army of Wu was repelled, likewise an army of Jin that had invaded Qi. The next ruler of Qi was Duke Dao's son, Prince Ren 壬, known as Duke Jian 齊簡公 (r. 484-482). Duke Jian's favourite was Jian Zhi 監止 (also written Kan Zhi 闞止), but he also relied on members of the family Tian. Tian Yang 田鞅, the ducal charioteer, warned Duke Jing to base himself on both Jian Zhi and Tian Chengzi 田成子 (also called Chen Chengzi 陳成子; Tian Chang 田常, a son of Tian Qi), but the Duke did not listen to him and made both his counsellors-in-chief. Jian Zhi had Tian Ni 田逆 (also called Tian Zixing 田子行) arrested after Tian had killed somebody, but the powerful family Tian managed to get him free from imprisonment. Tian Bao 田豹 was a favourite retainer of Jian Zhi, but he declined the latter's offer to make him the familiy head of the house of Tian. Tian Bao remained loyal to his family and warned them that it was high time to end the power of Jian Zhi in order to save the house of Tian. With the intention to kill Jian Zhi, Tian Chang and his relatives paid a visit to Duke Jing. Jian Zhi received them outside, and instead of entering one after the other, all Tians penetrated the gate, closed it and killed some eunuchs that wanted to push them back. Duke Jing, believing that the Tians tried to kill himself, took out a dagger to defend himself. Grand Scribe Ziyu 子余 had perceived the intention of Tian Chang and becalmed the Duke with the words that the Tians would only extirpate the evil endangering the duke, namely Jian Zhi, and did not intend not kill their lord. When the Duke was still enraged, Tian Chang tried to flee, but Tian Ni threatened to kill him if not all members of the Tian family stood like one man. Jian Zhi tried to enter the palace to save the Duke and kill the Tians, but he failed, tried to flee and was killed. When Tian Chang intended to kill Jian Zhi's follower Dongguo Jia 東郭賈 (Dalu Zifang 大陸子方), Tian Ni asked to spare him and allow him to go into exile. As a follower of Jian Zhi he refused to be given a cart by Tian Bao. Duke Jing was arrested, kept as a prisoner in Shuzhou 俆州 (normally read and written Xuzhou 徐州, near modern Tengxian 滕縣), and was soon killed by Tian Chang. His brother Prince Ao 驁 was made duke (Duke Ping 齊平公, r. 481-456). Tian Chang made himself counsellor. Fearing the the other nobles would attack him, Tian Chang concluded peace with the states of Lu, Wei 衛, and Jin and the powerful houses in the state of Jin, i.e. Han 韓, Wei 魏, and Zhao 趙. He also send tributes to the southeastern states of Wu and Yue 越 and made presents to his own people. With a clever method he made it appear as if all positive aspects of policy were credtied to the Duke, while Tian himself administered every aspect the people hated, mainly the penal law. Even if he thus appeared as the bad boy, Tian Chang was able to eliminate everyone who could pose a threat to him. Tian Chang had all members of the families Bao, Yan and Jian executed, as well as many princes of the ducal house. Their landed possessions, making out half of the state of Qi, fell into the hands of Tian Chang. Duke Ping was succeeded by his son Prince Ji 積 (Duke Xuan 齊宣公, r. 455-405). Tian Chang's successor as counsellor was his son Tian Pan 田盤 (also called Tian Ban 田班 or Tian Ji 田塈, posthumous title Tian Xiangzi 田襄子 or Chen Xiangzi 陳襄子); Tian Xiangzi was succeeded by his son Tian Bai 田白 (or Tian Bo 田伯, posthumous title Tian Zhuangzi 田莊子 or Chen Zhuangzi 陳莊子). Under Tian Zhuangzi's counsellorship, Qi made several raids on the soil of the disintegrating state of Jin, and also several times attacked Lu. Tian Zhuangzi's successor was his son Tian He 田和 (posthumous title Tian Taigong 田太公). After a long reign Duke Xuan died. The next ruler was his son Prince Dai 貸, known as Duke Kang 齊康公 (r. 404-384). Tian He had Duke Kang put under house arrest in Haishang 海上. In 402, Tian He met with the marquis of Wei, and both agreed to mutually accept as regional rulers. Marquis Wen of Wei 魏文侯 (r. 424-387) sent a messenger to the king of Zhou to ask for the ennoblement of Tian He, and the king accepted. Inspite of the fact that Duke Kang still officially reigned Qi, Tian He was called the Marquis of Qi 齊侯. After his death, he was therefore venerated as Grand Duke of Qi (Qi Taigong II 齊太公). He was succeeded as counsellor and factual lord of Qi by his son Tian Wu 田午, Duke Huan II 齊桓公 (r. 384-379). Duke Huan had many competent advisors, like Zou Ji 鄒忌 (also called Zou Jizi 騶忌子), Tian Ji 田忌 and Duangan Peng 段干朋. When Qin and Wei attacked Han, for example, the Duke was advised to secretly promise help to Han. This instigated Chu and Zhao to support Han, while the troops of Qi had enough time to attack Yan and to conquer some territory. Duke Huan's son Prince Yinqi 因齊 succeeded to the throne. He is posthumously venerated as King Wei 齊威王 (r. 378-343). In 379, Duke Kang died. With his death the house of Jiang was ended, and the house of Tian took over regency in the state of Qi. Duke Yinqi's reign began with a series of defeats and territorial losses to Wei 魏, Lu, Wei 衛 and Zhao. The reasons for this was that the overseer of the country's western part, the nobleman of Dong'a 東阿, had lined his own pockets, while in the east, the nobleman of Jimo 即墨 governed in the right way and had enriched the region. The noble of Dong'a was executed, likewise those at the court that he had bribed to sing his praise. Duke Yinqi changed his mind and took over a more active stance in government, led his armies towards the west and defeated the armies of Zhao, Wei 魏 and Wei 衛. The regional rulers began to admire the new ruling house of Qi, and the nobles in Qi ended their passive stance towards the fate of their country. The Duke's musical advisor Zou Ji praised the ruler for his excellent feeling for harmony when playing the zither, but also liked to teach him how to bring harmony into the government. He was made Counsellor-in-chief and soon afterward made Marquis of Xiapei 下邳 (posthumously venerated as Marquis Cheng of Xiapei 下邳成侯). In a conversation with King Hui of Liang 梁惠王 (Wei Huiwang 梁惠王, r. 379-335) Duke Yinqi explained what he perceived as the jewels of Qi: Not pearls, but loyal ministers like Master Tan 檀子, Tian Ban 田朌, Noble Qian 黔夫 and Zhong Shou 種首 that protected the country against the aggression of other regional states and against bandits. When Wei laid a siege on Handan 邯鄲, the capital of Zhao, and Zhao asked for support, Duangan Peng suggested to attack another town of Wei to relieve the pressure on Zhao, as an expression of good-will towards Zhao. The campaign was led by Tian Ji. Wei was heavily defeated in the battle of Guiling 桂陵 in 353, and Duke Yinqi, as the ruler of the strongest state at that time, adopted the title of king. Tian Ji was at odds with Zou Ji, and Gongsun Yue 公孫閱 tried to play off the one against the other via the King. In 346, Tian Ji, enraged about a feigned prophesy about an attempted usurpation by him, attacked the capital to kill Zou Ji, but he failed and fled. King Wei's son Prince Biqiang 辟疆 mounted the throne (King Xuan 齊宣王, r. 342-324). He called back Tian Ji from exile and asked him for further advice. When the besieged state of Han asked for help against Wei and Zhao, Sun Bin 孫臏, the military strategist, suggested supporting Han with the objective to destroy Wei. Help was promised but only sent after Han blamed Qi for continuing defeats. Tian Ji, Tian Ying 田嬰 and Sun Bin commanded a large army that utterly destroyed the troops of Wei in the battle of Maling 馬陵 in 341. General Pang Juan 龐涓, the commander of the army of Wei, killed himself because he had lost the battle. The victors forced the lords of Han, Wei and Zhao to audience with King Xuan of Qi. They had to swear peace before they were allowed to return. King Xuan afterwards met several times with Marquis Hui of Wei (i.e. King Hui of Liang), and the rulers of the two states decided during the conference of Xuzhou 徐州 in 334 to mutually address as kings. The two states also fought together against Zhao, but Zhao opened its dykes and prevented the joint army of Qi and Wei to advance further. King Xuan supported the Academy of Jixia 稷下學宮 where many representatives of different schools of thought were assembled and exchanged their meanings. Many of them actively participated in government affairs and acted as advisors for the King, like Zou Yan 鄒衍, Chunyu Kun 淳于髡, Tian Pian 田駢, Jie Yu 接予, Shen Dao 慎到 or Huai Yuan 壞淵. King Xuan's son Prince Di 地 succeeded to the throne, known as King Min 齊湣王 (r. 323-284). Under his reign, a lot of changes in the development of the overall power structure took place. It was the time of the coalition advisors, and the coalitions between the so-called "Warring States" virtually changed every year. The duke of Qin also adopted the title of king, i.e. King Huiwen 秦惠文王 (r. 337-311). His advisor Zhang Yi 張儀 managed to force the regional rulers to meet with the king of Qin in Niesang 齧桑. Tian Ying 田嬰, a relative to the royal house of Qi, was made ruler of the territory of Xue 薛. Wei, an ally in the war with Han and Qi against Chu in the battle of Chuisha 垂沙 in 301, became an enemy again. Together with the troops of Song, Qi defeated Wei in the battle of Guanze 觀澤. Su Dai 蘇代 advised Tian Zhen 田軫 how to deal with the situation that Wei asked for help with Qin and Han. Qi and Qin, for example, soon fought together against Chu, and a prince of Qin, Lord Jingyang 涇陽君, was sent as a hostage to Qi. Lord Mengchang 孟嘗君 (personal name Tian Wen 田文), a son of Tian Ying of Xue, even acted as counsellor of Qin for several months before he had to flee. Qi allied with Han and Wei to attack Qin and were able to enter the Hangu Pass 函谷關 in 296. Qi also supported Zhao in the destructive war against the short-lived kingdom of Zhongshan 中山. Su Dai and Li Dui 李兌 forged an alliance between Zhao, Qi, Chu, Wei and Han to attack Qin, but they gave up at Chenggao 成皋 without engaging Qin in battle. In 288, King Min planned to proclaim himself Emperor of the East (Dongdi 東帝), and King Zhaoxiang of Qin 秦昭襄王 (r. 306-251) would be Emperor of the West (Xidi 西帝). Yet Su Dai disadvised King Min not to do this step. Two emperors would compete for the title, and Qin would surely be the winner. Qi, instead, would fare better by attacking the bad ruler of Song and secure advantageous territory towards the borders to Yan and Chu. The King thereupon gave up the title of emperor and made war against Song in 286. The king of Qin was enraged because he was a protector of Song, but Su Dai becalmed the king of Qi with the explanation that Chu and Wei would fear the growing power of Qi and would incline towards Qin. If Qi and Qin were not united in an alliance, the other states would not necessarily be enemies of Qin. King Min's campaigns of conquest went on. He occupied some territory from Chu, forced Lu and Zheng into submission, fought against Wei, Zhao and Han, and, it was said, planned to replace the royal house of Zhou as the Son of Heaven. Under these conditions, Qin forged an alliance with Yan, Chu, Han, Wei and Zhao to punish Qi. The army of Qi was totally defeated, and general Yue Yi 樂毅 from Yan conquered the capital Linzi. King Min was able to escape to the court of the lord of Wei 衛, where he found refuge. The nobles of Wei did not like King Min because of his arrogance, chased him out, and he had to flee farther to Zou 鄒, Lu, and finally arrived in Ju 莒. The king of Chu felt pity and sent out general Nao Chi 淖齒 to help King Min, but instead Nao Chi killed King Min and occupied the southwestern part of Qi, while Yan held occupied its northwestern part. Prince Fazhang 法章 of Qi had become a retainer of Taishi Jiao 太史敫 (Taishi is said to be a family name) and had a love affair with his daughter. When King Min was slain, the refugees proclaimed Fazhang as the next king. He is known as King Xiang 齊襄王 (r. 283-265). The small state of Ju, in which the king reigned, was seen as the last stronghold against the conquerors. Chiang Kai-shek 蔣介石 (1887-1975) later used this example from history and compared Ju with Taiwan, a place from which the rest of the country should be conquered back (wu wang zai ju 毋忘在莒 "Don't forget we are in Ju!"). Taishi Jiao felt insulted that the King had married his daughter without a proper engagement through a matchmaker and refused to see his daughter until the end of his life. The Lady Queen 君王后 was nevertheless known as a very kindhearted person that even tried to mediate between the states in the time of nemesis. General Tian Dan 田單 was able to reconquer Linzi from Jimo in the east, and traveled to Ju to bring back the king to the royal capital. As a reward, he was given the title of Lord of Anping 安平君. King Xiang's son Prince Jian 建 succeeded to the throne, known as King Jian of Qi 齊王建 (r. 264-221; he has no posthumous title because he was the last of the dynasty). When Qin threatened to destroy the state of Zhao, the latter asked for grain to supply its army. King Jian first declined, but the advisor Master Zhou 周子 said that the state of Zhao was a protective shield for Qi ("the lips that keep warm the teeth") and must survive to have a puffer against Qin. Yet the king did not believe him. Qin totally destroyed Zhao in the disastrous battle of Changping 長平 and laid siege on its capital Handan. In the next years, King Zheng of Qin 秦王政 (r. 246-210) conquered and destroyed one state after the other, first the old and venerated Sons of Heaven in Zhou, then Han and Zhao, afterwards Yan, Wei and Chu. Qi was the last of the regional states to survive. The last counsellor to King Jian was Hou Sheng 后勝. It is said that he and other state officials of Qi were bribed by the Qin general Wang Ben 王賁 not to support the other states militarily and also to neglect the own army. Even when the army of Qin invaded Linzi, the people did not display the slightest spirit of resistance. The responsibility for the defenseless ruin of the state of Qi was charged to King Jian and Hou Sheng. In fact, Qi as well as the other states were thoroughly exhausted by two centuries of permanent warfare. 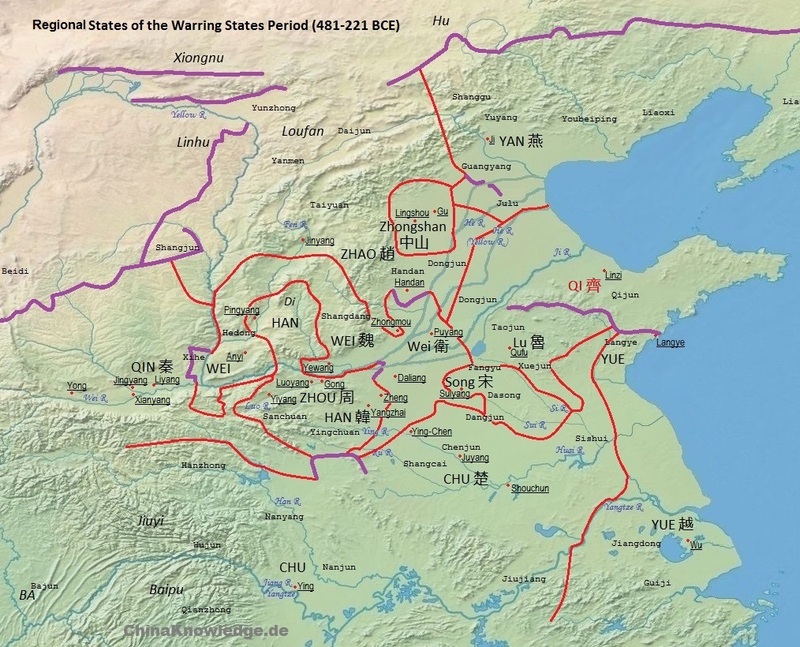 Qi was the last state of the Warring States era before Qin founded its empire in 221 BCE. 221 Qi conquered by Qin 秦.
Shiji 史記, 32, Qi Taigong shijia 齊太公世家. Li Ling 李零 (1992). "Qi 齊", in Zhongguo da baike quanshu 中國大百科全書, Zhongguo lishi 中國歷史 (Beijing/Shanghai: Zhongguo da baike quanshu chubanshe), Vol. 2, 761-762.